Losing someone is never easy. As we go through the stages of mourning, there are a few arrangements that need to be settled to offer loved ones of the deceased the chance to celebrate the life that was lived. 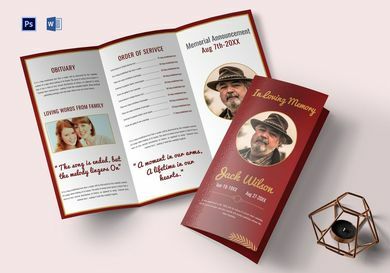 Funeral details are typically communicated through a brochure design. This enables friends and family of the departed to pay their respects within the time and dates indicated in the brochure. Pay tribute to a dearly departed friend or family member by using a funeral brochure to announce service details. With this template, you can customize each panel of the brochure to relay key information about the individual in a clear and direct manner. Easy customization will allow you to incorporate the intended text and graphics into the material so that the brochure may meet your personal preferences as well. 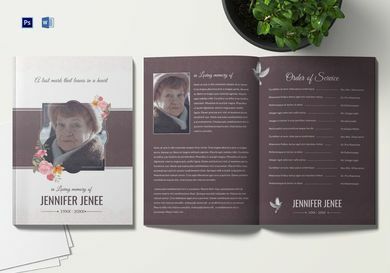 An elegant funeral brochure is perfect for ceremonies designed to commemorate the deceased and portray them in the best light possible. 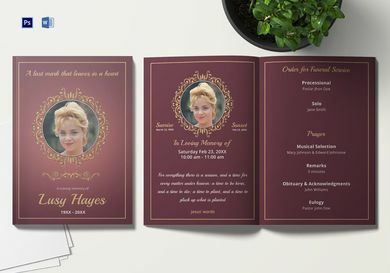 It uses the most ideal combination of fonts and colors to convey a sense of formality and sophistication for your funeral announcement. The great thing about a trifold brochure is that you have enough space to get a message across for readers to grasp. We often associate funerals with candles and flowers. That’s because certain types of flowers signify the innocence that has been restored to the soul of the deceased. 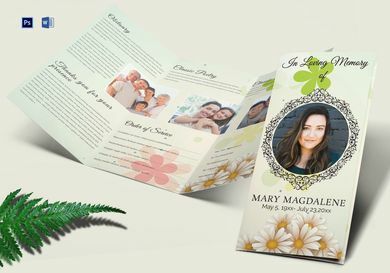 This is one of the reasons why using a floral brochure design for your funeral program is highly recommended by experts. Many consider floral a great addition to an otherwise gloomy environment as well. 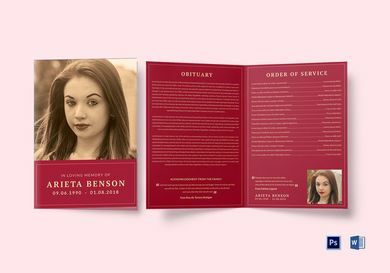 If you’re having trouble deciding which size to use to make a death announcement and to communicate the services that were planned, an A4 bifold brochure would be a good option. 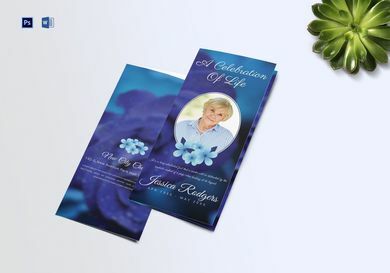 This allows you to keep your funeral brochure short and simple in honor of the departed. Death is not something you can expect at any given moment. But even then, people have every right to be informed about this matter, especially if they share a close relationship with the late individual. Despite the short notice, you can still use an invitation to gather guests at the funeral service. Funeral details will be reflected in the brochure for recipients to be aware. Some families host programs to honor the departed. This is a tradition that many people still practice as a way of remembering a loved one. If you’re thinking about doing the same, you can use the template above as an outline examples for your funeral brochure. You can edit the copy in each panel to personalize your brochure and keep it as a token to commemorate the event. Arranging a funeral service can get pretty stressful, so you want to make sure things run as smoothly as possible. To help guide guests throughout the event, designing a funeral service bifold brochure is highly advised. The brochure will appear like a booklet that readers can skim through to find the information they need. It’s also a good size that people can carry around and keep inside their purses or pockets for convenience. It’s common to have both a funeral and a memorial service as a way of paying tribute to someone you love. In such cases, you might have a few more information to deliver to guests so they stay informed about the upcoming services. 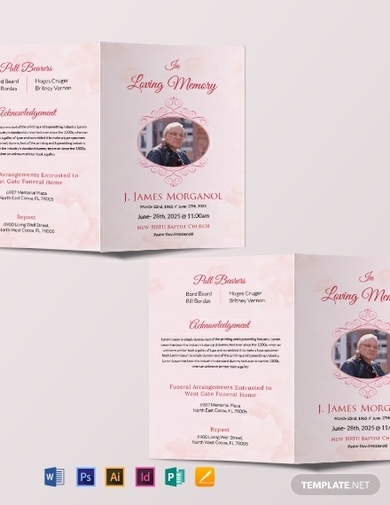 One way to reduce production expenses is to use the same brochure for the funeral and memorial service details. Traditional funeral brochures sometimes appear old, worn-out, and depressing. Even with the whole essence of the event, this isn’t exactly a good design choice to settle with. 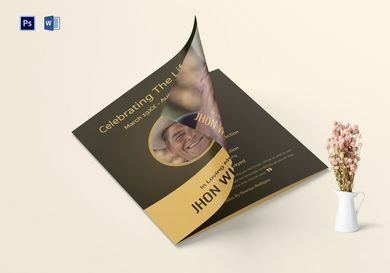 A modern funeral brochure offers a fresher look that allows you to celebrate one’s passing with positivity. 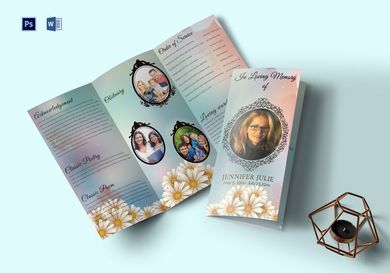 It consists of the right set of elements to make your funeral brochure seem simple yet professional to guests. Notice how newspapers have a designated area for obituary announcements and the like? 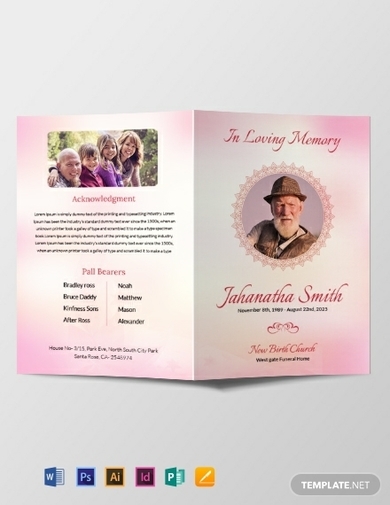 A great way to cut down on costs is to use the same design for both your obituary and funeral brochure. That way, you can also consider not to invest in a newspaper space and simply use the brochure to make the announcement. A bifold brochure makes it easy for readers to scan through the material by putting every single detail on display with one flip of a page. This type of funeral brochure can come in handy for those who are running late but still need the brochure for reference. People with different religious and cultural backgrounds usually have a different form of ceremony prepared for the departed. 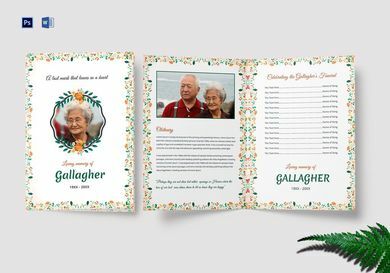 To make sure your arrangements are communicated clearly to guests, feel free to use the Catholic funeral brochure above for quick and easy production. With a lengthy to-do list to fulfill, using a brochure template is one way to lessen the load. 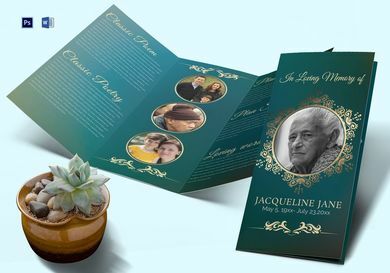 A funeral brochure template will spare you the time and energy to help you focus on other priorities for the funeral service. 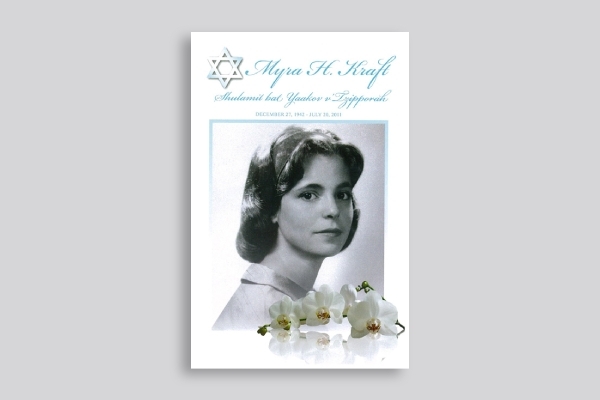 Shown above is an example of a funeral program brochure featuring a prominent member of today’s society—Myra Hiatt Kraft. The brochure was designed to uphold her roots and showcase her life from a youthful perspective. She was known as a philanthropist who worked alongside various groups to provide financial assistance to Jewish parents and to help promote Jewish identity among teenagers. 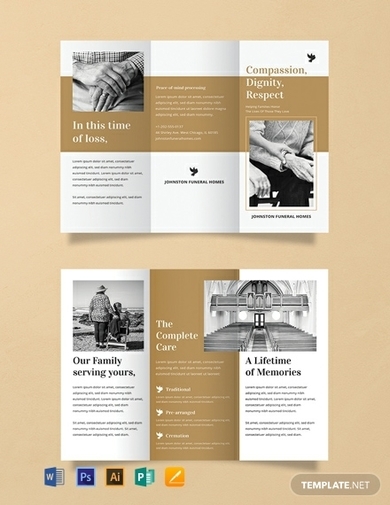 A simple funeral program brochure is usually designed to radiate positivity in spite of the circumstance at hand. 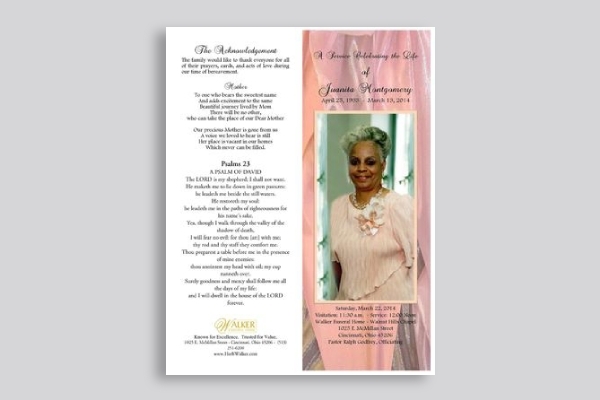 Similar to the example above, font and color choices play a key role in the look and feel of your funeral brochure.